Register here for our FREE WEBINAR on Thursday, March 28 at 12 PM EDT. 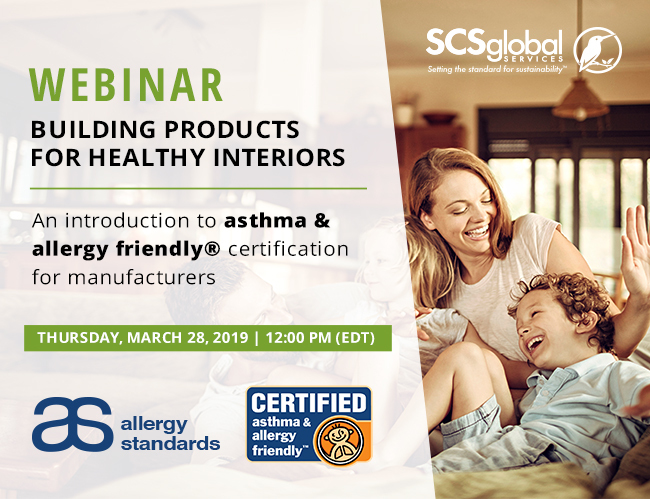 March 20, 2019 /3BL Media/ Join Allergy Standards Limited and SCS Global Services to learn how certifying interior building products as asthma & allergy friendly® can differentiate your company within the growing health and wellness market. This free webinar will cover the basics of the asthma & allergy friendly® certification, including the science behind the standard and how it is unique among green building certifications. Get insights from the experiences of market-leading early adopters, such as Tarkett, Owens Corning and True Value. These companies and others are harnessing the power of asthma & allergy friendly® certified products to stand out within the crowded green building sector. Discover how certifying your commercial and residential interior products can benefit your business. Worldwide, consumers are increasing their demands related to health and wellness, and the asthma & allergy friendly® certification resonates with these wellness-minded customers. The certification gives the hundreds of millions of people affected with asthma or allergies a scientifically tested alternative to avoid triggers. Even people not impacted by asthma or allergies judge certified products be of better quality than non-certified products. We will discuss these topics and more in our free informational webinar. Register now!